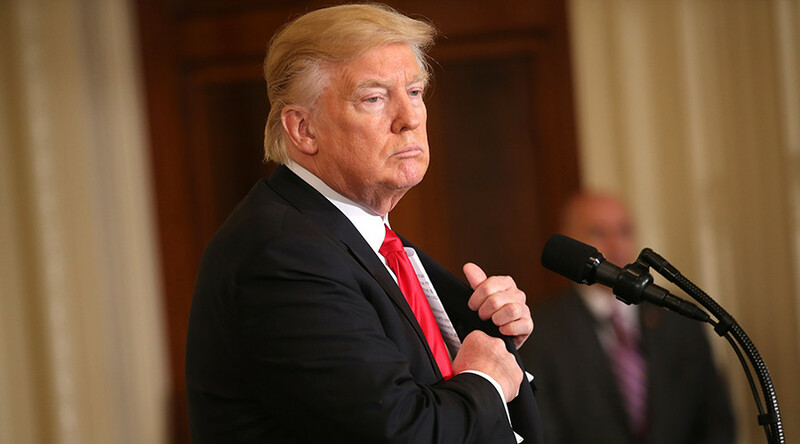 US President Donald Trump has defended his executive order on immigration which restricts access to citizens of seven Muslim-majority nations to the US. Rejecting the ‘Muslim ban’ label, he said it will only be in place until new security policies are implemented. “We will again be issuing visas to all countries once we are sure we have reviewed and implemented the most secure policies over the next 90 days,” he clarified. He then questioned the reaction of the media, saying that former president Barack Obama actually issued a related order, adding it was during Obama’s term that the seven countries picked for Trump’s ban were pinned. “My policy is similar to what President Obama did in 2011 when he banned visas for refugees from Iraq for six months. The seven countries named in the Executive Order are the same countries previously identified by the Obama administration as sources of terror,” Trump said. — RT America (@RT_America) 29 января 2017 г. “The joint statement of former presidential candidates John McCain & Lindsey Graham is wrong – they are sadly weak on immigration. Senators should focus their energies on ISIS, illegal immigration and border security instead of always looking to start World War III,” Trump tweeted. On Saturday evening, Judge Ann Donnelly from New York’s Eastern district issued a temporary emergency stay on the order in a lawsuit filed by the American Civil Liberties Union (ACLU) on behalf of two Iraqi immigrants, Hameed Khalid Darweesh and Haider Sameer Abdulkhaleq Alshawi. The ruling prohibits authorities from deporting immigrants who had already arrived or were on their way to the US. Judge Donnelly’s ruling was promptly followed by similar pronouncements by other US judges in Massachusetts, Virginia and Washington. In Boston, Judge Allison Burroughs and Magistrate Judge Judith Dein imposed a seven-day restraining order on the ban’s implementation. A temporary restraining halting the deportation of affected migrants was also issued by Judge Leonie Brinkema, in the Eastern District of Virginia, who also ruled that detained immigrants be granted access to lawyers. However, senior US administration officials cited by Reuters, say all of Trump’s executive orders remain in effect and are being enforced. The travel ban order has been a “massive success story,” an unnamed official told Reuters. Dozens of migrants have been stranded at US airports since Trump signed the order, with several hundred either detained in transit or refused boarding on US-bound flights. Starting Saturday, hundreds of Americans flocked to airports calling for the ban to be lifted while expressing outrage at Trump’s order. Protesters are also demanding the immediate release of detained immigrants. 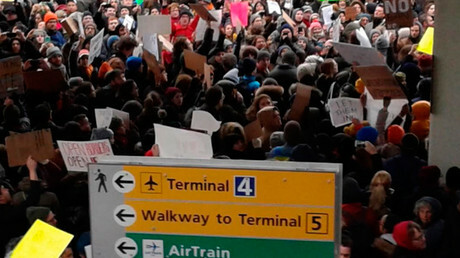 At JFK airport in New York City - where at least 12 immigrants were detained in accordance with the ban - the protest was backed by taxi drivers who joined the action, with the New York Taxi Alliance announcing a one-hour work stoppage. Anti-ban protests continued into Sunday, with people in over 30 cities taking to the streets. Thousands converged on Lafayette Park near the White House in Washington, DC, some flying the flags of the Muslim-majority nations affected by the executive order. As chants of “no hate, no fear, refugees are welcome here” and “the people united, will never be divided,” reverberated across the seven-acre public park, protesters also flooded Pennsylvania Avenue, yelling "Islamophobia is un-American""No justice! No peace!" and other similar slogans. Part of the crowd broke from the main march and proceeded to stage an impromptu protest near the Trump International Hotel. — Lauryn Gutierrez (@GutzyLo) 29 января 2017 г. Mass protests have also been held in Atlanta, Philadelphia, Seattle, Orlando and New York City, where the city’s mayor, Bill de Blasio joined the rally. Boston Mayor Marty Walsh was another prominent politician to personally appear at the rally against the ban. “Can you hear us Washington?! We’re standing strong in Boston to support & protect ALL of our people & we will not back down #NoBanNoWall ” Walsh tweeted. — Mayor Marty Walsh (@marty_walsh) 29 января 2017 г. 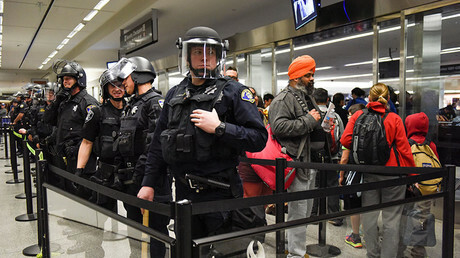 At Los Angeles International Airport, riot police were deployed to prevent potential clashes between ‘Muslim ban’ protesters and Trump supporters who stood across the street from each other, USA Today reported. At Dulles International Airport the demonstrators sang "This land is my land, this land is my land" as they cheered those arriving at the at the international terminal. — Aaron Vallely (@Vallmeister) 29 января 2017 г.